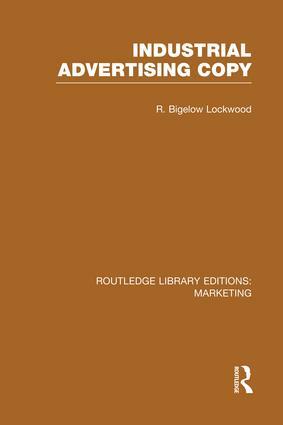 This book provides a detailed explanation of the basic principles that underlie the writing of industrial advertising copy, written at a time of tremendous expansion in industrial advertising, in the early part of the twentieth century. This is a practical textbook of its time, covering facts which anyone writing advertising copy should know before attempting to reach industrial markets. It highlights key points in the planning and writing of industrial advertising copy, with the aim of simplifying the work of the copy-writer. Although inevitably a product of the time in which it was published, this volume nonetheless contains many valuable tenets of advertising which remain a core part of modern advertising theory.